So-called ocean iron fertilisation (OIF) has been seen as a strong candidate for geoengineering - modifying some aspect of the land, ocean or atmosphere to soften the blow of global warming. 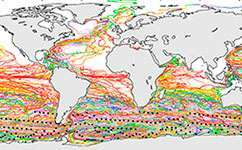 It would involve feeding iron into parts of the ocean where its absence is the major factor limiting plankton growth – that is, where other vital nutrients are plentiful but iron is scarce. 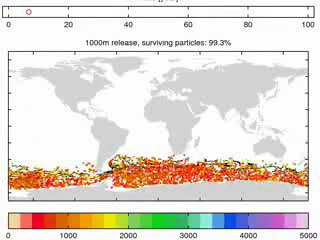 Video showing the movement of the particles by which the carbon from iron fertilisation were represented using the oceanographic model. Each dot represents one particle; its colour represents its depth underwater. Robinson says the research shows the importance of considering ocean circulation in assessing these kinds of proposal. 'A lot of the discussion has centred on the Southern Ocean, but from a physical oceanographer's point of view it's about the worst possible place to hide carbon,' she comments. Somehow, the science press has plenty of time to ridicule geoengineering, but can't be bothered to make protecting the best carbon sinks above sea level a priority. Here is practical geoengineering: plant some trees. Better yet, stop cutting them down where they matter most: equatorial forests/jungles in Brazil, Africa, and Indonesia. Then let and help them recover. I can't and should not take any sort of carbon policy or 'climate change' related agenda seriously until it is willing to make the protection of equatorial, tropical jungles etc the very first priority. If humanity literally used no fossil fuels whatsoever, but still burnt down the equatorial biomes so they could be turned into farmland, then all the dire predictions would have to stay about the same anyway. Restoring equatorial biomes is better than not, but mostly too late: burning them down releases 500+ years of stored carbon, while reducing the total capacity of the biosphere to fix carbon. Whatever man tries to do to reign in "climate change"----it will all be futile. Or, could make things worse. If carbon mitigation becomes necessary (unlikely according to Dyson), the planting of fast growing plants will occur. Problem solved. This issue is driven at least partly by those who believe the State should control the means of production. If you *have to* pick a genius scientist as your contrarian idol, a towering giant of Lord Kelvin's stature beats the pants off dinky wee Freeman Dyson. Y'know, that pretty much sums up anything new we try. I'm real glad the likes of you aren't in charge of things. We'd all still be living in caves, living short nasty lives, probably dying painfully, and in general not knowing squat about anything. Here's a practical geoengineering approach: Get some reflective screens into space. They don't need to be overly large. Dumping gunk into the oceans certainly doesn't sound like a 'no side-effects guarateed'-scenario to me. Pretty much the opposite. And we have NO way to clean it up if stuff goes haywire. None whatsoever. What is wrong with you people!! CO2 is not a problem. Too little CO2 is a problem. If you cut our current CO2 concentration in half you will kill all plant life on earth. The current giant elephant in the room that is harming the planet isn't CO2 its things like Glyphosate which is an endrocrine disrupting, cancer causing, patented-antibiotic that is in the rain, soil, and tissue of every man woman and child in Western civilization. If you cut our current CO2 concentration in half you will kill all plant life on earth. Erm..how about: no? Where do you get that idea? facts of minimal requirements for plant life to exist. You know...science. CO2 is not a problem. How, in your *expert* judgement, is it not a problem? Just because various synthetic chemical pollution is a problem, doesn't preclude excess CO2 from being a problem. You're employing a false dichotomy. Also Glyphosate is a pesticide, not an antibiotic. That's not to say excessive (ab)use of antibiotics isn't a problem. But again, all of these are not mutually exclusive issues. I am not applying a false dichotomy. I'm pointing out a real problem with real immediate hazards (glyphosate). Which is an herbicide, not a pesticide like you said, and is a patented antibiotic. I didn't patent it Monsanto did. You, on the other hand, are attributing magical and non-scientific properties to CO2. Plant asphysxiation due to lack of CO2 is between .02% and .016% (depending on species). Plants evolved with several times the CO2 we currenlty have. I apologize, when I said pesticide I indeed meant herbicide. But then weeds are a kind of pest aren't they. Anyway an antibiotic is something that specifically targets bacteria. Antibiotic is a synonym for antibacterial. As for 'magical' or 'unscientific' CO2 properties, I suggest you at least find the global warming article on Wikipedia and familiarise yourself with the bare fundamentals of this SCIENCE in lieu of continuing to spout sheer inanities. Cheers. I said glyphosate (Roundup) is an antibiotic (you know the kind the CDC is warning against overuse because of supergerms being created by said antibiotics) because it is. Monsanto has a patent on glyphosate as an antibiotic. That is a real danger, not CO2. I know the global warming theory well. It's the catastrophic crisis global warming that is obviously nonesense. For one even as CO2 has increased there has been no global warming for 18 years. I'm of course referring to empirically measured values from satellites. I know the value and effect of CO2 as a greenhouse gas, which is why I discounted the crisis theory long ago. Monsanto has a patent on glyphosate as an antibiotic. Only half-true. Glyphosate acts as an 'antibiotic' only in combination with certain 'adjuvants'. By itself, it is quite ineffective as an antibiotic, and is readily metabolized by soil bacteria. Glyphosate's primary identification is as an herbicide; its weak antibacterial properties are more of a side-effect. It's the catastrophic crisis global warming that is obviously nonesense. For one even as CO2 has increased there has been no global warming for 18 years. You obviously do not. You are ignorant of the physics involved. See this is what I keep talking about. Real crisis issues are ignored (Glyphosate) and false crisis (catastrophic global warming) is paid attention to. First: Glyphosate does not readily metabolize you Mansanto apologist. Glyphosate is in rain and water supply and found in the breast milk of mothers across the country. It bioaccumulates in human tissue as well as animals that are fed this crap. The EPA, fraud organization that it is, keeps increasing by thousands of percent its allowable amount of this poison. But CO2, which is non-toxic plant food, they are all concerned about. Nonesense. I do not apologize for Monsanto. Humans and animals are not bacteria. I *agree* with you that Glyphosate is a problem, you dimwit... And, I can both walk and chew bubblegum at the same time - we can be addressing both CO2 and other pollutants. Pollution controls are not mutually exclusive. You cannot address CO2 that will reduce its concentration in the atmosphere. Its not a problem anyway. You cannot prove CO2 is a problem (especially when its a net positive good) at least in any scientific way. You are selling a belief system via a narrative. Not scientific proof. What is your proposal what would actually work? Anything? Natural removal of excess CO2 from the atmosphere is a process that takes many centuries, even if we abruptly stopped adding yet more CO2 into the system. It's far slower in action than the GW effect of that excess CO2. As for solutions, it's pointless discussing them with someone who refuses to acknowledge the very existence of the problem in the first place. And physics has long since proven that excess CO2 is a problem. That you are ignorant of the math and data involved (and seemingly smug and proud about your ignorance - as if it were some badge of honor - well, maybe among the secret moron society, but I digress), doesn't make any of it go away. All it produces is a picture of you standing bent over, with your head buried deep in the ground.